Mark Latham just won't go away. Like a drunk that has been ejected from every pub in town - even the most disreputable of dives that'll take anyone - denied a chair on which to perch and share his incoherent ramblings, he's set up himself outside, regaling the public with his largely unwelcome rants. And as this brave warrior of "free speech" spews forth his bile, bravely continuing his "important work" that largely consists of attacking women who've never harmed him or anyone else, people rightly condemn him - no Mark, the left is not "afraid of you", and no one is trying to silence you; even if we wish you would shut up, we can't and won't stop your tired, irrelevant whining. But there's a bit of historical revisionism in there, too. People wrongly remember the past. How did this guy ever get to be Labor leader, they wonder. Almost Prime Minister! 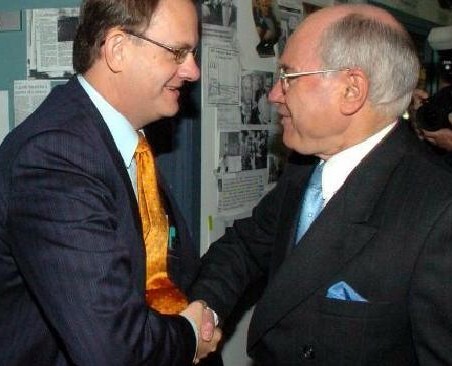 Now we have two things to be grateful to John Howard for - the assault weapons ban, and beating Latham in the 2004 Federal Election. Thank goodness the electorate saw the man's madness and heartily rejected him. Except that's not how I remember it. I started blogging back in 2004, and in the middle of stupid cat memes and discussions of cask wine, I wrote a lot about Mark Latham. And it was favourable. Look, that's how it was. Remember, John Howard had led us into the Iraq war just the year before. People hated him. And who had Labor been running with for years - Kim Beazley? Simon Crean?! Good God. Into this stepped Mark Latham. He represented - how else to put it - hope and change. He was young and good looking. (I was a little attracted). And the crucial thing is, he didn't seem nuts. He wasn't. Policies on healthcare and education were a refreshing change from the Howard government. He wanted to say "Sorry" and he wanted to bring the troops home from Iraq. "The worm" decided Latham won the leader's debate. Labor was ahead in the polls for much of the campaign. Yes, there was that business with the taxi driver; and the infamous handshake, where a young, tall Latham appeared to almost cripple the elderly prime minister, perhaps spoke of the bullying to come. But Latham viewed in 2004 as a nut with anger management issues whom we could all do without? No. The loss was not a rout, and the fact Labor lost seats came as a surprise to many. It's perhaps most instructive to look at the media coverage immediately after the 2004 election loss - a time when journalists are no longer trying to curry favour with a potential incoming government and Prime Minister, and instead feel reasonably free to say what they really think. Tom Allard of the Sydney Morning Herald wrote that the rejection of Latham was due to his inexperience against the seasoned Howard. Mark Metherell reported that Latham and Labor lost on economic credibility, too focused on getting on the nightly news rather than policy. In a joint article Allard and Metherell agreed Labor failed on policy, releasing theirs too late for voters to digest. Antony Green said it was basically all about interest rates. "The ALP leader has emerged as a credible alternative PM, despite the election. He had run a very good campaign; he had been disciplined, forthright, confident and had presented a broad range of policies that embodied his vision of a "fair, generous, inclusive Australia". Latham has redefined the ALP as a reformist political movement, he's ditched its disastrous "small target" strategy and refocused the party on some of its traditional aims: redistribution, reconstruction of the enabling state, an independent foreign policy and a reaffirmation of something close to equality in public policy." And I do remember a news article saying that the electorate has said to Latham not no, but not yet. So no, the national consensus was not that we'd dodged a bullet, Howard saving us from crude, misogynistic bully Latham. Mark Latham was all right, then. He wasn't the bitter, angry bully he became later. It was the 2004 election loss that broke him. The usual scenario after an election loss is to regroup and reassess, vowing to fight on or gracefully resigning and handing over to a successor. Shell shocked, devastated, and battling a bout of serious illness, Latham was capable of doing none of those things. Something in him snapped. Maybe this reaction is proof he wasn't capable of being PM on the first place - perhaps, perhaps. But something in the 2004 loss sent him reeling, and I remember thinking, when he appeared on Andrew Denton's Enough Rope in mid 2005, that he looked about ten years older than he had the year previously. Whatever snapped in his psyche, to leave the reddened, bitter individual we see today desperately gasping for airtime, imagining himself some hero by attacking the domestic violence campaigners and anti-racism activists he sees as the biggest threat to our nation - it wasn't on show then. Maybe without the shock of loss, Latham would have been a decent PM. I doubt it. But if we dodged a bullet, it wasn't through careful character assessment, but dumb luck.